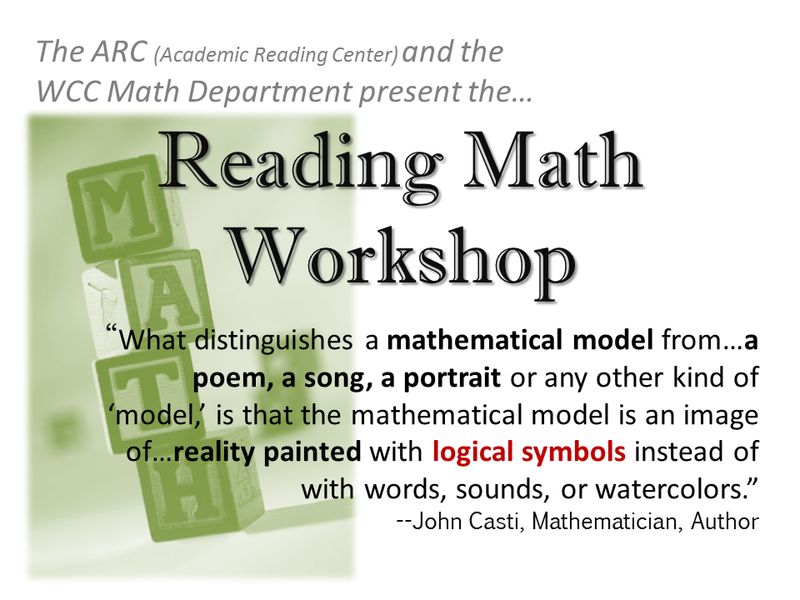 The Reading Math Workshop | Save My Reading Life! Math is beautiful. Any person dedicated to the study of math will tell you that there is beauty in how numbers, formulas, and proofs work together. However, for those of us who have had negative experiences with math, it can seem overwhelming. Once you see that math is a kind of art form–albeit an exact one–it becomes much easier to appreciate the beauty of it. Do not be afraid of math: try to find the beauty in it. False: Math is a written language; if you’re not reading it then you’re not learning it. All the pages before your homework sets–the chapters–contain valuable explanations, examples, detailed processes and instruction beyond what your teacher can provide in class. Learning math is really about learning a new and very detailed written language; it has its own symbols and grammar that is often unfamiliar. A student would never expect to learn a different language, like German or Japanese, without taking the time to at least look over and familiarize himself with the writing of that language. 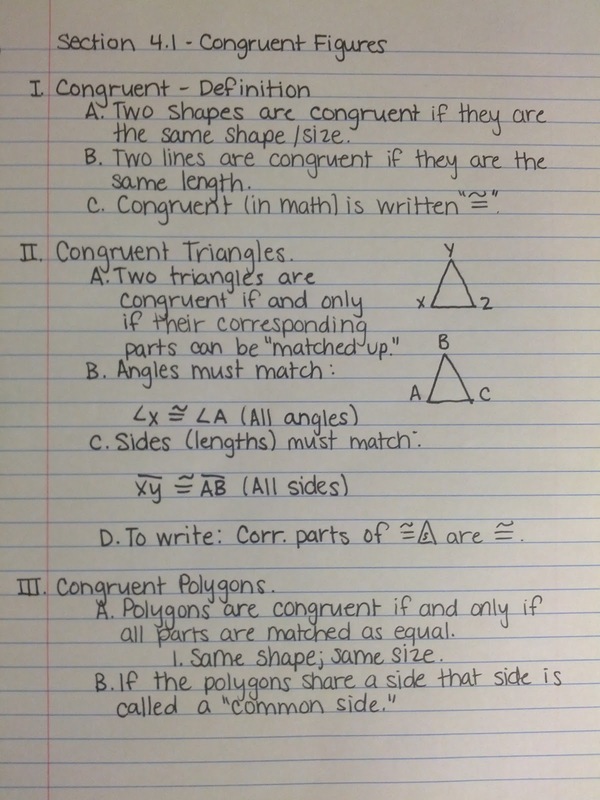 Math, like other languages, as definitions, sentences, paragraphs, syntax, and grammar. Unlike most other languages, math is almost exclusively a written language so if you are not reading it then you are not learning it. 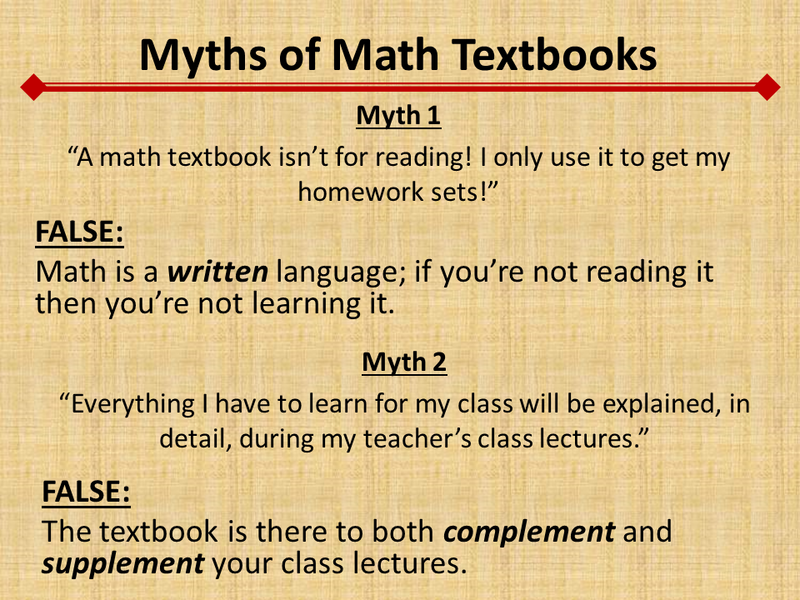 False: The textbook is there to both complement and supplement your class lectures. While in class, your teacher has 20, or oftentimes many more, students who all must understand the material being presented. Each student has a different background with math, different education levels, different comfort levels, and different learning styles. The teacher simply does not have the time to teach the class specifically to each student to assure that each one understands it. It is your responsibility to learn those things that you personally did not understand, or the material that was not covered at the depth you needed, by reading the textbook. The textbook is there to both complement and supplement the lectures. False: You must read in all directions and the author intends for you to make connections between many parts of the text. Math is a subject that is learned cumulatively–that is, it is a subject that demands that you understand older, already taught information before you can completely understand new information. For this reason, you must read in all directions and, more importantly, the author intends for you to skip around and make connections between paragraphs and chapters. By skipping around, you are making mental notes of the connections between the ideas, and the significance of the relationships between the new information you’re learning and the old information you are already familiar with. Examples of skipping might be skipping back a chapter to review how exponents work when you begin a new chapter on multiplying exponents. Or, the author may prompt you to flip to an appendix in the back of your book to look at a chart or table to help you understand a problem better. Do not skip the temptation to review previous chapters or the author’s prompting: you may miss an important tool that will make your homework easier. False: Anyone can learn math! Think about a skill or talent you have, like driving, reading, fixing cars, writing, or playing an instrument. Were you born with this ability? Of course not; with years of training, education, and practice you have learned to drive, read, fix cards, write, or play an instrument. There are, however, people out there who may possess and ability that allows them to go far beyond the average ability, like race car drivers, famous novelists, or virtuoso pianists but, by and large, they are not the majority. Math is the same: anyone can learn math. There are people who can solve complicated mathematical formulas and study well beyond calculus, but these people are not the majority. Instead of focusing on how terrible you are at math, be positive and assert yourself into the subject like you would any class in which you feel confident. By staying positive, you will be more likely to succeed and you will not suffer the mental pressure of predicting your own failure. the cover (front and back) – note any websites, or inserts that might be important. 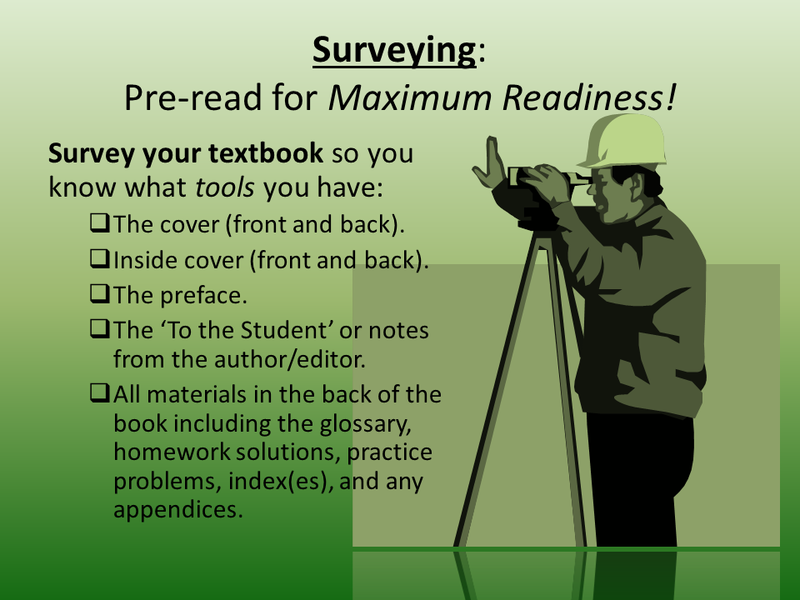 the preface – this will often tell you, the student, how the book should be used. all the materials in the back including appendices, glossary, homework solutions, practice problems, and the index(es) – knowing what materials are available to you will make it easier should you need to find them again. As you find useful materials in your text, put a sticky note so you can find them quickly and easily when you need to. Based on the title, what is the chapter going to be about? Do I know anything about this topic/subject already? What kinds of things might the author tell me or explain to me in this chapter? How does the author start out the chapter? Is it an example, a formula, or something else? What might the rest of the chapter say to support this introduction? Read the headings, subheadings, and bulleted lists. Are there words you do not know? Look up the definitions in your glossary. Examining pictures, charts, graphs, and other visual aids; read the captions, too. Do you recognize any of them? Can you make sense of any of them? Read the chapter summary, problems, solutions, and chapter questions at the end of the chapter. Can you answer any of the questions already? Is there anything in the chapter that is particularly challenging? Or anything that is mostly review? Write down any questions you have before you read. Once you finish reading, use these questions to check what you’ve learned. If you can answer the questions you’ve asked after you’ve read, then you can be more certain that you understand the material. Annotating your math books is just as important as any of your other books. Typical math texts have short chapters, lots of example problems, and not a lot of explanation, so it is sometimes easy to justify skipping them. 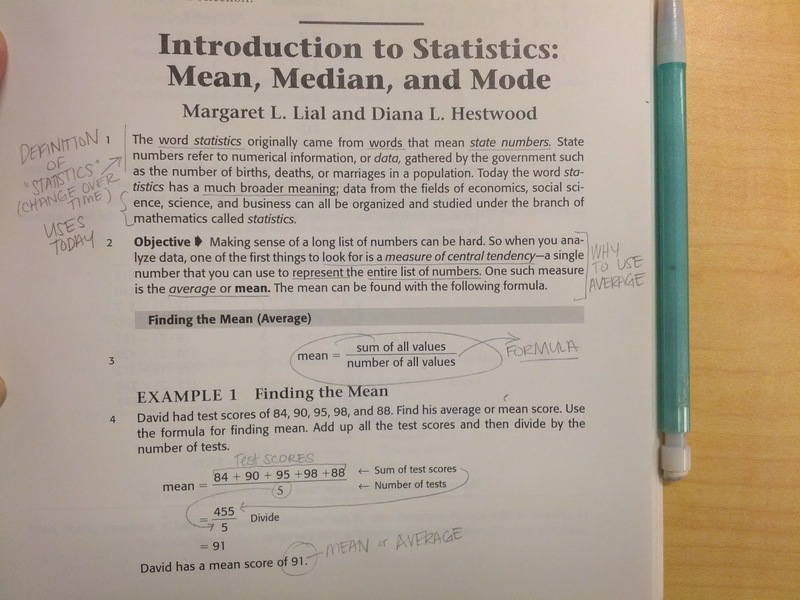 Annotating math books is not hard, but it is different from other kinds of annotation. – Dr. Peter Kahn, Annotating mathematical material: a route to developing holistic understanding and learner autonomy. Annotation is a way of carrying on a “conversation” with the text. 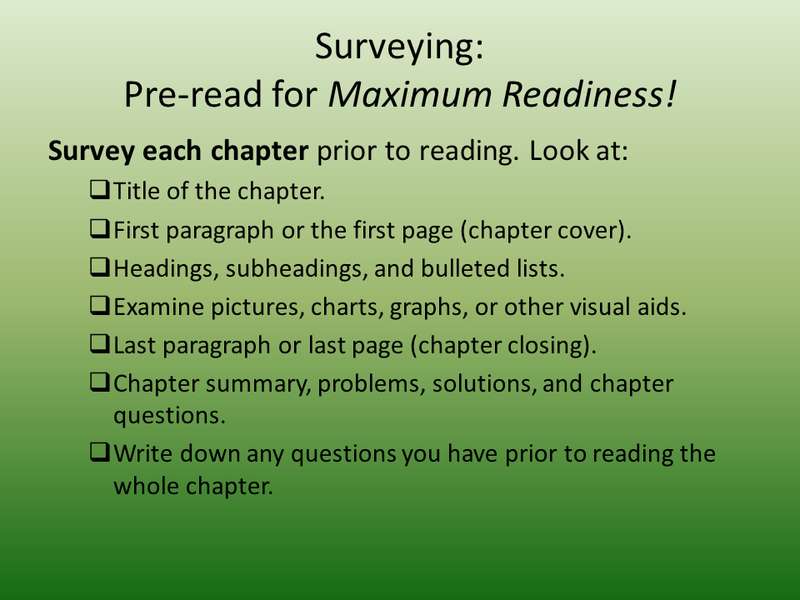 While you read your math text, make a point to ask questions, look for answers, add steps, or write down your schema. All of these things, and more, can help you connect with the materials. Keep in mind as you read that math is a cumulative subject: this means that what you learned in previous classes is very relevant to your current class. As you annotate, it is important to make connections between “old material”–those things you already know and have learned–and the “new material”–the information in your current class. One way to annotate is to simply remind yourself how this new material connects to old material. Another important annotation method is to add steps to the examples in your text. Oftentimes, the text will present you with a series of steps to follow to complete a problem but, since there is limited space on a page/in a text, they may skip steps deemed “simple,” or “unnecessary.” If, however, you find these steps (no matter how small) to be important to your understanding, make a point to add those steps in to help your understanding of the problem. 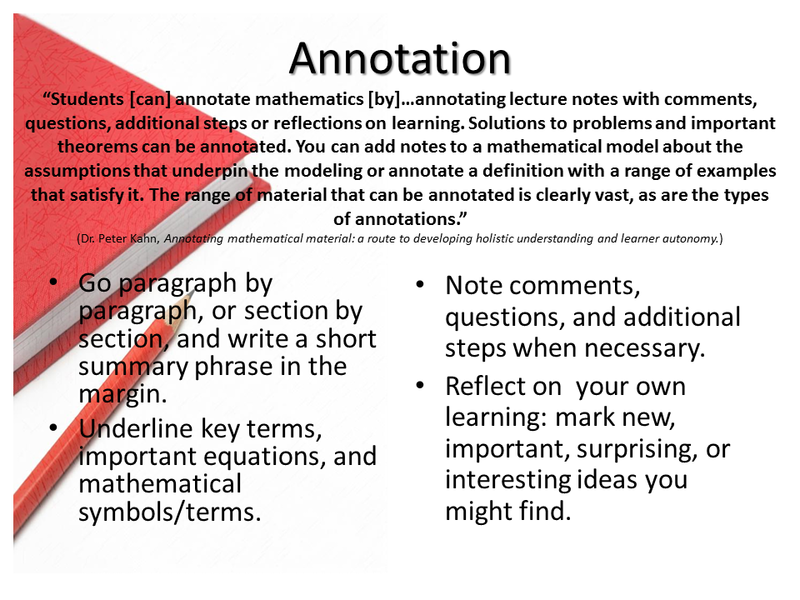 Slide 7: Annotation – Don’t Skip the Examples! Examples are a very important part of your math text. While it is tempting to see an entire page dedicated to an example problem as one less page you must read, you need to read those examples carefully to make sure you understand how to complete the problem. One method of “reading” the examples is to treat them as problems you must work through on your own, then compare your answer and steps with that of the book to see if you are understanding what you must do. Take a sheet of paper and cover up all but the first line of the problem. Using what you have learned so far in the chapter (or what you should have learned) work through the problem on your own. When finished with the problem, uncover the answer and steps and compare your answer and steps with those of the book. Ask yourself: is my answer correct? If yes: did your steps match those in the text? What was different? Why? If no: What did you do wrong? What kind of error did you make? A simple math error or a concept error? Use the explanations/summaries in the chapter to decide how best to do the problems: sometimes the way that works for you is the best way but other times it is best to practice the way your book (or teacher) recommends. 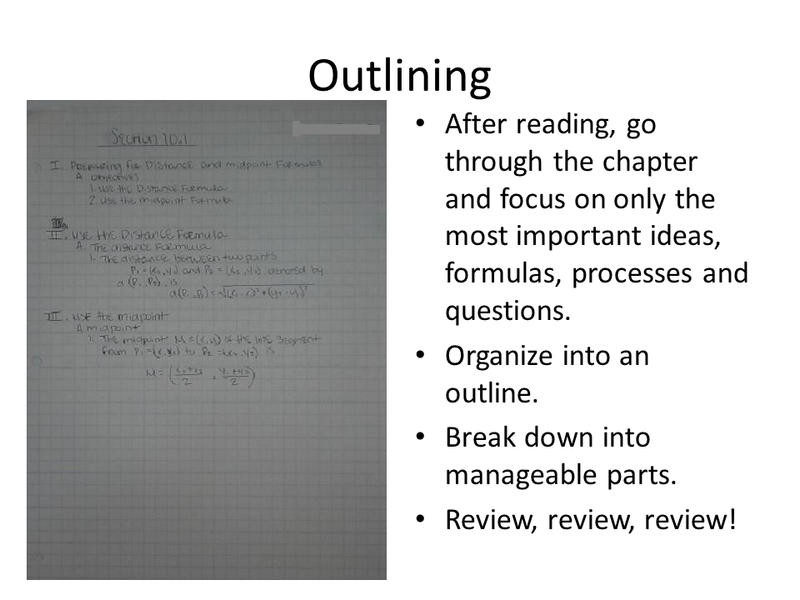 Outlining is an excellent method to help organize chapter information into short, manageable notes. Once you have surveyed and annotated your chapter, go through and pull out the most important main ideas, formulas, processes, and information to put into an organized outline. After reading, go through the chapter and focus on only the most important ideas, formulas, processes, and questions. Summarize and paraphrase those things into manageable parts. Break problems down with explanations and steps. Add “definitions” of symbols, formulas, and functions in language you understand (translate from “math” to English [or a more familiar language]). When you are done with your outline, you can put it in your notebook and use it to study from or refer back to it to keep the chapter fresh in your mind as the semester goes on. Mapping is a visual form of outlining that can be particularly helpful for students who have trouble “translating” from math to their own language. 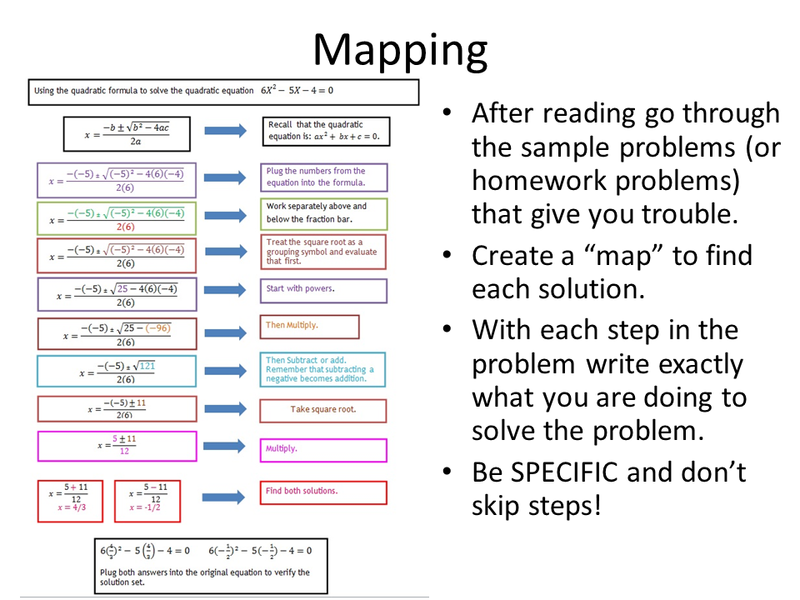 In the example on the slide, the student uses an example problem of the quadratic formula to move through each step while using color to show where the work in the formula is occurring. On the right side of the map is the “English translation” of each step. Remember, if you can explain how and why each step works then you can feel confident you will remember those same steps on an exam. 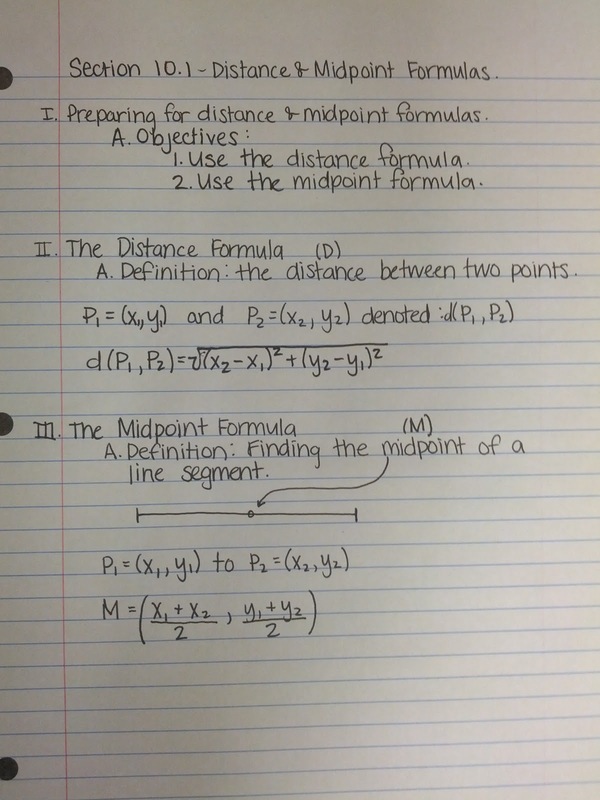 After reading, go through the sample problems (or homework problems) that give you trouble. Creating a map to find each solution. With each step in the problem, write exactly what you are doing to solve the problem. Be specific and do not skip steps! Kahn, Peter. (2010). Annotating mathematical material: a route to developing holistic understanding and learner autonomy. MSOR Connections 10(1). Liverpool, UK: University of Liverpool, Center for Lifelong Learning.